It's never a good sign when you sit down to review a book you finished only a few days ago and realise that you can’t actually remember any of the character’s names. In my head they’ve become ‘the cop dad’ or ‘the teenage daughter,’ which would tell me, if I didn’t already know, that the characters in 'Vacation' lack any kind of depth. They come across like stand ins. As though when the author was sitting down to sketch out his story plan he said ‘ok, so there’s a dad, and he’s a cop,’ and then forgot to go any deeper. But I know some people are able to enjoy books with flat characters, and so I suspect there are people out there who will enjoy 'Vacation.' It’s an action packed little books, one that you finish really fast even if you weren’t intending to. A cop gets injured on the job and decides to take his family on a holiday, except when they get to the holiday park things are not what they seem. 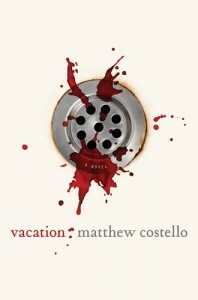 ‘Vacation’ takes what I couldn’t help but think of as the ‘Feed’ approach to zombies. The story is not about them. They’re an established part of the world, shambling about in the background while the main storyline plays out. Which is not a criticism. I actually really like this approach. The first few desperate hours following a zombie apocalypse can be thrilling, but I also enjoy reading about societies that have adapted to co-exist with with their new shambling neighbors. This is probably ‘Vacation’s’ strongest point. The zombies have only been around for a decade or so, and while people are holding on you get the impression that things are still getting worse and worse. Fresh food is a real luxury, with most people living off perfectly healthy but unappetizing genetically modified food. I liked the way that the youngest son tends to fixate upon food, as he has never known a world where it was not scarce. I say that this was the book’s strongest point. A less charitable part of me wants to say it was the books only strong point. The plot is unpredictable only in its predictableness. You think to you self, ‘no, that’s not going to happen it’s way too obvious’ and then it’s a small surprise when the obvious thing actually happens. Again and again. I think maybe the book should have been longer. They get to the camp and instead of slowly jacking up the feelings of ‘not rightness’ for a few days, let the characters and the reader grow increasingly uneasy, things happen way, way too quickly. The reader isn’t given a chance to get attached to Officer whats-his-name and his family before their lives are in danger, which lowers the suspense considerably (and is another side effect of replacing real characters with cardboard cutouts). Plus, ok, here is my biggest grievance against this book. I almost didn’t say anything because it verges on nitpicky, but it really spoiled the book for me. Mistakes in the continuity. Glaring ones! In an early chapter the cop refers to his wife as a really light sleeper and she always wakes up when he comes to bed. Then, in a later chapter, he thinks about how he’ll have no trouble sneaking out because his wife is such a heavy sleeper. The one thing this book has going for it is that it barrels along and you get caught up in it, but errors like that bring the whole thing to a screeching halt. I have to go flicking back through the pages to see if I read it wrong, which obviously yanks you right out of the story. And it’s not like that was the only example. At one point the cop thinks that his kid’s screaming is going to get them all killed, then only a few paragraphs later, mere paragraphs for crying out loud, he’s thinking about how proud he was that his kid never made a sound. I mean come on! But like I said, it’s a quick read. And even though it’s all very obvious what is going to happen and it could have used a more thorough edit, I can’t say that I was ever bored. I would recommend this book to people who don’t care about characters as much as I do, or people who really like zombies in all their forms.